More than 200 police officers across three Northern Virginia police districts will wear body cameras as part of a pilot program. Police patrolling the Reston, Mason and Mt. 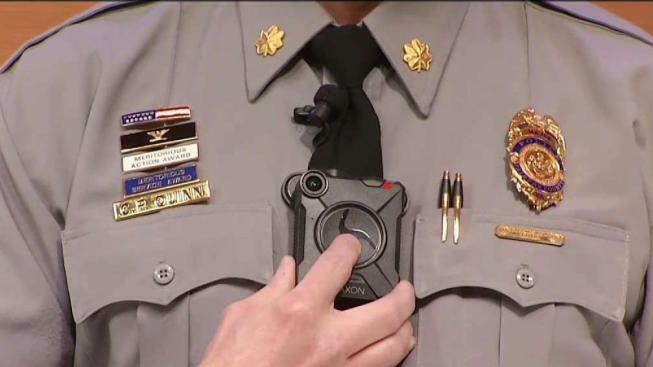 Vernon districts will wear uniforms with the body cameras. The new cameras will be recording anytime officers respond to a scene and during routine traffic stops. More than 200 police officers across three Fairfax County, Virginia, police districts will wear body cameras starting in March as part of a six-month pilot program. Police patrolling the Reston, Mason and Mt. Vernon districts will wear uniforms with the body cameras, which Fairfax County Police officials said will promote transparency. Fairfax County Police have been using car cameras for 10 years. The new cameras will be recording anytime officers respond to a scene and during routine traffic stops. Under certain circumstances, though, people can ask that they be turned off. If a resident speaks to police to report a local neighborhood crime and wants to remain anonymous, for example, the resident could request that the camera not record. For routine cases in which there is no criminal activity involved, the public can also ask officers to shut them off. Fairfax County Police Capt. Chantel Cochrane said that anyone can ask whether they are being recorded. The new cameras will be introduced more than a year after the Fairfax County board delayed the program’s start date. The department spent about two years drafting its body camera policy and consulted community officials from groups such as the NAACP. The body cameras could prove beneficial for significant police-involved incidents, such as when a U.S. Park Police officer shot an unarmed man after a chase on the George-Washington Parkway in November. After that altercation, Roessler released dashcam video. He’ll decide whether to release body camera video and said he'll do so when it’s in the public’s interest.